I Expect You To Die! : How Good Was Kronsteen? In From Russia With Love, we're presented with Kronsteen as S.P.E.C.T.R.E. #5, head of Planning, a chess genius and arrogant mastermind of evil. Well, based on what we see, how true is that? Two things of note here. 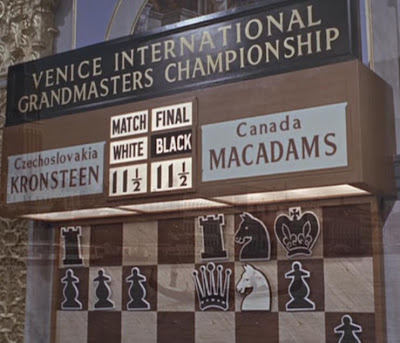 First, this is being billed as an "International Grandmasters Championship." 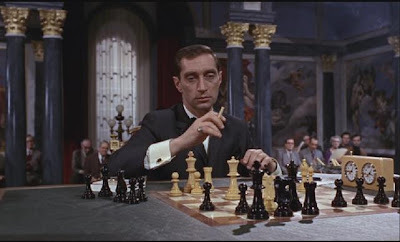 In the novel, Fleming merely had Kronsteen the 3-time Moscow champion...he explicitly hadn't reached grandmaster status. I guess the producers wanted to pump up his rep, to make him a worthy opponent for Bond. Secondly, note that this is the final match, and that the score is 11 1/2-11 1/2. In chess matches, you get 1 point for a win, and 1/2 point for a draw. In other words, at this point Kronsteen and his opponent, the Canadian MacAdams, are in a dead heat. If Kronsteen is so much better than everyone, he sure hasn't proven it against the Canadian. Unless, of course, he's just toying with him. 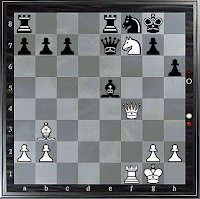 Now, given this position, this was a no-brainer, according to Chessmaster. No matter what level of skill I set the program to, from Bobby Fischer to a rookie 8-year-old girl, this was the move it made. It wouldn't even consider another line. So while the move is a very solid one, it hardly proves his brilliance. 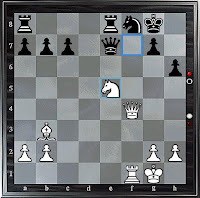 This was a terrible blunder, according to Chessmaster. It really was the worst possible move he could make. Before, while he had a big positional disadvantage, he wasn't behind much materially, and could have forged a draw (or even won the game eventually, if he were playing the 8-year-old). But now he's locked himself in, and Kronsteen moves for the kill: Queen E4 check. The audience jumps up and murmurs, as if was some unexpectedly exceptional move, and MacAdams congratulates Kronsteen for "a brilliant coup." Chessmaster just yawns, however. Again, the move was so superior to other possibilities, I couldn't get Chessmaster to make another, no matter how poor I made his skills. MacAdams is correct to resign here, as his only option result in Mate in 4, Mate in 9, or a long drawn out bleeding that will inevitably result in Mate unless Kronsteen falls asleep. Well, we didn't learn much, did we? Kronstein, for the whole match, was dead even with MacAdams. And the moves we see him make are the exact ones pretty much any player would make. Any brilliance has to come from how Kronsteen put MacAdams in that position to begin with, which sadly the movie doesn't show us. So it's hard to judge exactly how good Kronsteen actually is, particularly since this victory was due in part to his opponent's blunder. Of course, we do see all the moves of his game against Bond. Kronsteen's plan to get the Lektor would have worked, had Red Grant not gotten greedy for a few more gold sovereigns (what, S.P.E.C.T.R.E. doesn't pay enough?) and have some class warfare arguments with Bond. And Tania actually falling in love with Bond, while not having much impact on the outcome, wasn't projected either. He did correctly read the British mindset that they couldn't resist a trap; he did foresee that setting England vs. Russia would cover Grant's activities; and his man did end up with the Lektor, and Bond should have died. He, as he boasted, foresaw "every variation of counter-move"...except where emotions came into the mix. It was the human element that failed...which is why chess masters might not be the best people to plan operations. Ok, now you're just getting too thorough. One can never be too thorough when it comes to S.P.E.C.T.R.E.!! Here's a post idea for you. What IS it with the SPECTRE copyright? Is it not lumped in with Bond's? I ask because the James Bond RPG changed didn't have access to SPECTRE and called it TAROT instead. No Blofeld either. In the late 50's, before Broccoli & Saltzman bought the Bond rights, Fleming was approached by prospective producer Kevin McClory. They collaborated on a Bond TV series or movie, and decided to do an original story rather than adapt a script. The result was several screenplay versions of what would come to be known as Thunderball. They couldn't get anybody interested, so the project fell apart. Fleming then decided to take the various scripts, along with new stuff, and turn it into the Thunderball novel. He did not credit McClory for his work, though, and a massive lawsuit resulted in a re-crediting of the book on subsequent printings, and McClory having the movie rights to the story. Broccoli & Saltzman paid McClory to make TB (and made him a producer) with the stipulation he not make any movies out his remaining Bond materials for a decade. When Blofeld and S.P.E.C.T.R.E. were set to return as villains in The Spy Who Loved me movie, lawsuits began to fly. McClory's ten years were up, and he was planning more Bond movies. And since Blofeld and S.P.E.C.T.R.E. originated in those early Thunderball scripts, McClory claimed he owned them, too. Eon decided not to fight it, which is why we haven't seen Blofled et al since. Terribly oversimplified, but that's the story. McClory died about a year and a half ago, and i honestly don't know what the status of the rights concerning the TB scripts, Blofeld, or S.P.E.C.T.R.E. is these days. But that's why your Bond RPG didn't go with S.P.E.C.T.R.E, because of huge legal quandaries. A good overview of the whole mess can be found here. I still hold out hope that the fact that McClory lost his last lawsuit could pave the way for the organization hinted at in Casino Royale being a new version of SPECTRE. There's every chance that EON feels confident that without any corporate backing to pay the lawyers, his heirs are unlikely to stop them from at least using SPECTRE. The only thing that got Sony to pay McClory's legal bills was the possibility of another Thunderball remake to compete with the official Bond, and that's highly unlikely to be doable again. Thanks Snell! I guess that explains Blofeld's unceremonious death at the start of Live and Let Die too. I don't know about SPECTRE making a comeback though. It seems overly silly under that acronym for today's Bond. 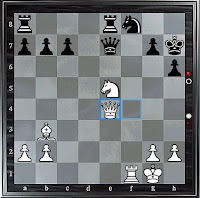 The main difference is MacAdams' King h7 blunder, which sets up a quick "cinematic" defeat. Nobody under grandmaster strength has ever won the Moscow championship for many decades, so far as I know. Fleming's Kronsteen certainly could have been a GM by implication. Because he's a Psychotic Maniac?